To write a note next to the equation you are solving e,g answer to problem 1, function 1, problem 2; tap the division bar ( / ) twice, then write your comment. Enter one equation per workspace. In the following screenshot, the next equations entered into the same window would be marked "false". The app automatically evaluates these equations using the value obtained from the first equation keyed in. Solve the following equations. Then, identify the type of equation. Write it beside your solution. The equation is linear. Type // using the division bar, then write the word “linear” using the Qwerty keyboard. The equation is quadratic. Type // using the division bar, then write “quadratic." Enter the expression as it appears in the problem: /2x + 1/ = 5 by using the absolute value function |x|. The equation is an absolute value. Type // using the division bar, then write “absolute value." The equation is a polynomial. 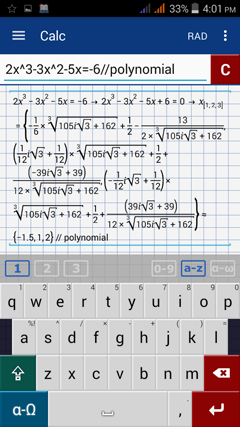 Type // using the division bar, then write “polynomial."